The Tweed – New Haven Regional Airport opened in September 1931, with first commercial service to Islip, on Long Island. Today, this airport is one of only two in the state of Connecticut with scheduled passenger service. The airport occupies 394-acres and is home for 41 aircraft, mostly single-engine. There is a federal contract control tower open 16-hours everyday, with an average workload of 114 operations each day. Ten of those daily operations are commercial passenger (air carrier and/or air taxi). FAA compiles ATADS data for this facility. Airport operations in 2012 were DOWN 26% vs. 2007 operations, and DOWN 59% from the peak year (1990). …A Rockwell AC69 crashes after a go-around, impacting two homes. 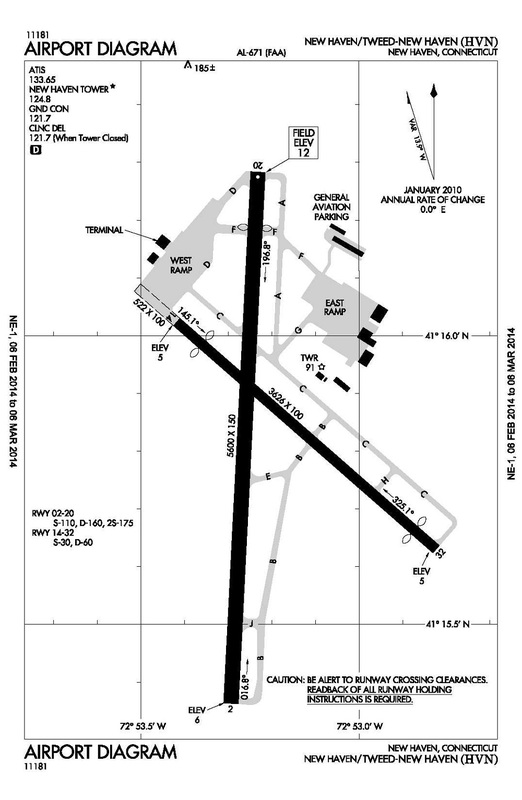 …Official announcement issued by the airport authority, that FAA has approved their Noise Plan. Notes that the next step is to seek funding, mostly from FAA. …References FAA approval of the noise plan finished in November 2012, and discusses plans and funding for some 65dB noise improvements. A line at the end of the article indicates the consultant forecast growing GA demand and airline service to DC and Chicago, thus an expectation of more noise in the future. Interesting reader comments. …This article credits actions by the two senators with keeping New Haven and the other CT contracdt towers open in the face of the sequester threat. …One citizen, a 58-yr-resident, opined that every time the report is things will get better, but his experience is they only get worse. He sees these efforts as angling for handouts: “The thing I think is happening here is, they’ve been looking for funding, They’re looking for federal money to improve things…” and think the study will help.